Angel Greyhound decal with the dog breed silhouette wearing a wing and halo, with “Furever in my heart” underneath. Beautiful memorial vinyl sticker for dog lovers whose pets have crossed the Rainbow Bridge. This item can be personalized with the dog’s name for an additional fee. Please enter dog’s name in the personalization box. Max 12 characters. Decal measures approximately 4″ wide and 4.4″ tall. How to apply a vinyl decal. All of our designs are formally registered with the US Copyright Office. Please respect artists’ rights and support small business by purchasing directly from us. Designs are licensed for sale only through Inky Dinky Dax Designs LLC, Sew Dog Crazy, and Menagerie Mayhem. Put a Greyhound stamp of approval on your vehicle, front door, laptop – most any smooth surface! This fun Greyhound decal has a paw print inside a circle, with the text “Greyhound Approved” around the outside. Fun dog lover vinyl stickers. Perfect for dog lovers, this Greyhound Girl decal is simple, fun, and just plain cool. A great way to boast about your favorite dog breed without taking up a lot of room or being too detailed. Our Greyhound decal looks great in a vehicle’s rear window. Decal measures approximately 4.8″ wide by 1.6″ tall. Simple, cute and directly to the point, this Greyhound decal has a large heart with a silhouette of the sighthound dog breed inside. On the lower left is written “Greyhound.” Browse our entire assortment of Greyhound Decals to decorate all your vehicles in your favorite breed! Decal measures approximately 5″ x 4.7″. A very cool embroidered sweatshirt! Three sighthound silhouettes, in various poses of running, are spread out in a line, each with two boxes of color behind it. Beautiful stop-motion type way of looking at the elegance of a Greyhound’s run. View available color options and sizing guidelines. Thread color will vary with your chosen apparel color. Your item may not have the same colors as the example shown. To request specific colors, please use the Personalization Box at the right, above the “add to cart” button. A very cool embroidered t-shirt! Three sighthound silhouettes, in various poses of running, are spread out in a line, each with two boxes of color behind it. Beautiful stop-motion type way of looking at the elegance of a Greyhound’s run. Pretty Greyhound embroidered sweatshirt says “Greyhound Lover,” with fun scrolling swirls with dog bones and a paw print. This design looks gorgeous in a variety of color combinations – write your color theme in the personalization box or be surprised with what we choose! Rhinestones are also available for an additional fee. See the product photos for a rhinestone example. Color used will be complementary to the design. Pretty Greyhound embroidered t-shirt says “Greyhound Lover,” with fun scrolling swirls with dog bones and a paw print. This design looks gorgeous in a variety of color combinations – write your color theme in the personalization box or be surprised with what we choose! Rhinestones are also available for an additional fee. See the product photos for a rhinestone example. Color used will be complementary to the design. Funny Greyhound sticker reads, “Greyhounds don’t have owners – they have minions!” Great humor for pet lovers, especially those of us who find ourselves being “owned by” instead of “owning!” Includes a silhouette of the dog breed and paw prints. Available in a wide selection of breeds and colors. Decal measures approximately 6″ wide by 4.8″ tall. Cool diamond shaped sign decal has a Greyhound dog silhouette inside, with “ON BOARD” and two paw prints. Fun dog lover vinyl stickers show your favorite dog breed! Decal measures approximately 5″ x 5″ as shown, but is 3.7″ square on its side. A completely unique Greyhound Ornament adds a classy touch this holiday season! These original creations are made one at a time, given a spritz of glittering sparkles, and hand tied with a white ribbon to hang on your tree, on the wall, almost anywhere around your home. Our Free Standing Lace dog breed ornaments are a beautiful addition to a Christmas tree and make a lovely dog lover gift. A cute Greyhound dog breed decal represented as a stick figure, with long skinny legs, slim body and ears that stick out. Match it up with our other vinyl stickers for your own unique look. Do you sometimes feel like a Greyhound Taxi Service, driving to training classes, the vet, trials, and of course, those trips for ice cream? Well now you can clearly label your vehicle as a Greyhound Taxi with our fun and unique dog lover decals. These vinyl stickers have a silhouette of your dog breed, along with diamond shapes and “TAXI SERVICE” written underneath. Available in a variety of colors, these funny decals are sure to be a hit! Decal measures approximately 6″ wide x 3″ tall. Die cut vinyl Greyhounds Rule sticker is perfect for the pet owner participating in dog sports. On one side of the fun text is an agility bar jump, on the other side is a rally obedience cone. A delightful way to show off your Greyhound’s versatility. We also offer an option to replace either the cone or the bar jump with a Q ribbon. The decal’s dimensions will differ slightly with any of the “Only” options. Decal measures 5.8″ wide by 2.3″ tall. It’s a Greyhound thing. You wouldn’t understand. Funny Greyhound decal is perfect for the dog owner who tries and often fails to explain the little things about the breed that only an owner would know. Breed specific vinyl sticker is available in many dogs, with a silhouette on the upper right. Decal measures approximately 8″ long and 1.8″ high. We only sell our original designs in both embroidery and heat pressed vinyl. Every item is designed and created by one person! 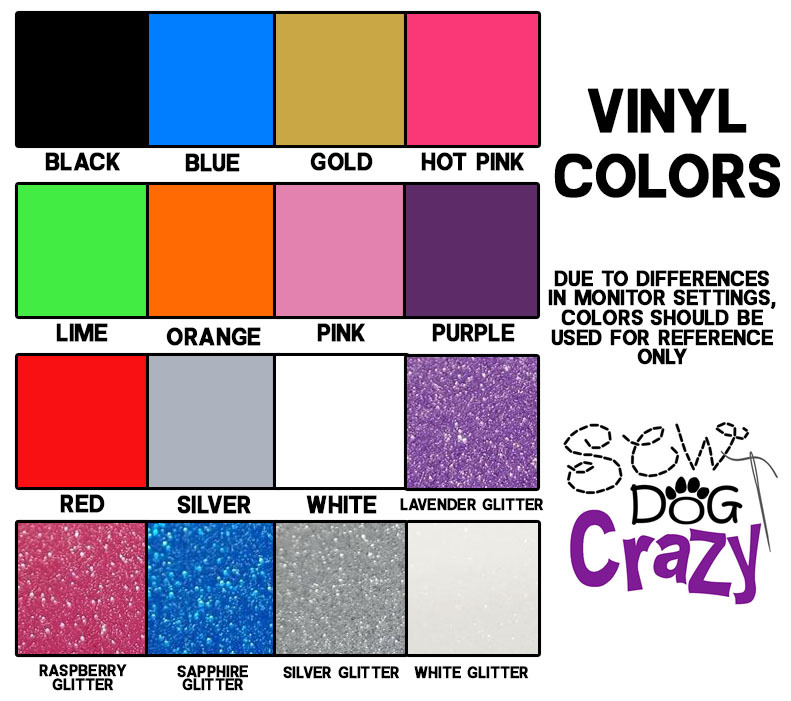 We are SEW crazy about dogs, and hope you are too! All designs are copyrighted Inky Dinky Dax Designs LLC. Nothing may be reproduced without express written consent. We do prosecute to the fullest extent of the law, as well as performing a voodoo ritual so that fleas infest your armpits for at least a year. We securely accept credit cards and PayPal. Copyright	© 2019 Sew Dog Crazy. All Rights Reserved.